On a day Clint Dempsey was honored in a pregame retirement ceremony, the Sounders overcame an early deficit and defeated Sporting Kansas City to set a league record with their eighth straight victory in the same season in the post-shootout era. They also extended their unbeaten streak to 11 matches. Fewer than two minutes into the post-Clint Dempsey era, Stefan Frei and company had allowed their first goal in weeks in a match they could not afford to lose. And so, his Sounders gathered themselves as they so often have during what is now an eight-game winning streak — a Major League Soccer record for most in a season in the post-shootout era. And ultimately, their 3-1 victory Saturday over Sporting Kansas City came down to the home side capitalizing more often than the visitors on opportunities that appeared right in front of them. It was a solid response by a team that initially appeared to still be settling in after a pregame ceremony in which the retiring Dempsey was feted by 39,530 fans at CenturyLink Field. Off the field, they might address why they failed to respond to a five-man attacking press deployed by SKC right from the opening kickoff. But on it, they addressed their setback just 10 minutes later when summer transfer window acquisitions Brad Smith and Raul Ruidiaz hooked up for a perfect cross and tap-in to equalize. Then the Sounders caught some second-half breaks. A Harry Shipp cross attempt deflected off defender Graham Zusi for a 52nd minute own-goal. That was followed minutes later by an Ike Opara handball call and a Nicolas Lodeiro penalty-kick goal that helped put this match away. Still, despite the two-goal margin, the aggressive SKC side looked dangerous much of the afternoon and narrowly missed several chances to make a game of it. In fact, they nearly took the lead late in the opening half when the hard-luck Opara — not exactly known as a goal-scorer — beat a defender and bore down all alone on the Sounders’ net. Frei raced out to cut down the angle, deflecting the ensuing shot wide. And SKC never got closer to taking another lead, having entered the day second in the Western Conference and holding the final first-round playoff bye position — seven points up on a Sounders team that had to win for a realistic shot at that. And win they did, creating a logjam atop the conference that temporarily had five teams no more than five points behind first-place FC Dallas. About the only downside for the Sounders was an 81st-minute red card to Chad Marshall for a dangerous foul on SKC attacker Johnny Russell. Head referee Baldomero Toledo, speaking to The Seattle Times in a pool-reporter capacity, said he ejected Marshall upon video review because he’d delivered a “straight leg, cleats to (the) opponent’s upper calf and knee’’ that endangered his safety. The video angle reviewed by Toledo, shown to The Times on a smartphone by his assistants, was said to differ from television replays. Toledo said he took into consideration the ball appeared to be moving in a different direction from where Marshall’s foot was heading when it struck Russell’s leg. Toledo added that had Marshall struck Russell foot-to-foot, it would have been different. Marshall will automatically miss the Sounders’ next match at Vancouver unless his team appeals. Sounders coach Brian Schmetzer said he’d wait to see the angle Toledo reviewed before commenting further. But Schmetzer was willing to comment on the team’s win in a “playoff- type game” and the record streak while having taken down some of the league’s toughest teams. Besides Sporting Kansas City, the Sounders lately have beaten conference-leading Dallas, New York City FC, the Los Angeles Galaxy, Portland and tied Supporters’ Shield contender Atlanta United FC on the road. The tying goal was a blueprint of how the Sounders hoped to improve during the summer-transfer window. Recently acquired left back Smith took a beautiful Osvaldo Alonso through ball, played it up the left flank and fired a perfect cross to a sprinting Ruidiaz for the finish. It was the kind of play the Sounders have badly missed since left back Joevin Jones departed last winter. 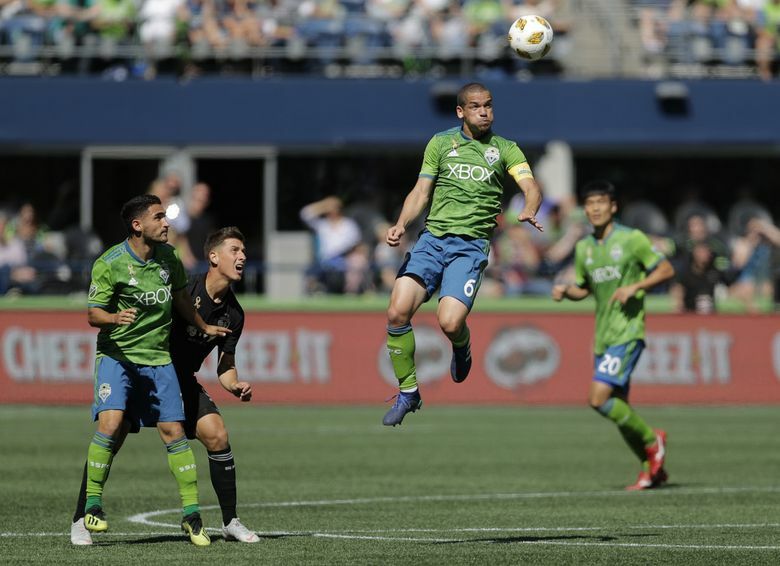 Another hallmark of late is the Sounders winning just about all of their second-half games; an annual tradition that shows few signs of stopping as the team begins life after Dempsey.